Wayne-O-Rama is CLOSED. It was open from November 19, 2016 to September 30, 2017. 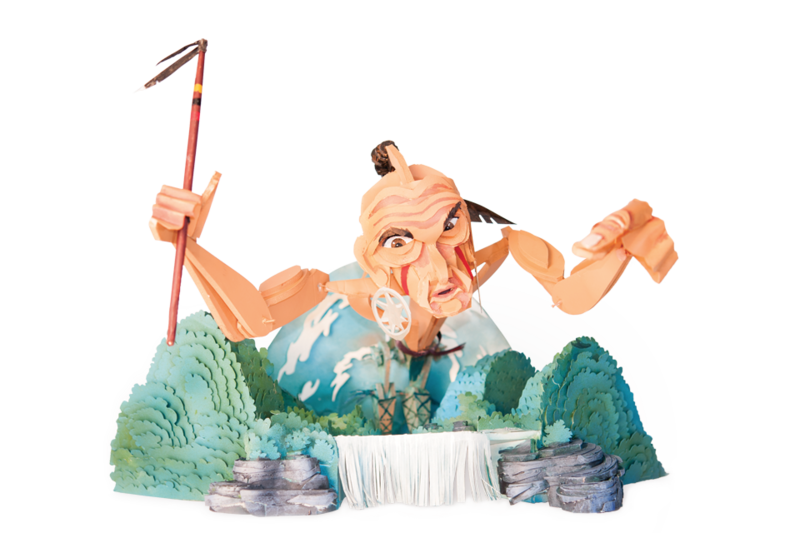 Wayne-O-Rama’s sculptures will be stored temporarily and eventually put on display at various locations throughout Chattanooga. For updates, “Like” our Facebook page. If you weren’t able to visit, check out our PHOTO GALLERIES and visit our ONLINE STORE to have unique Wayne-O-Rama merchandise shipped to your door! 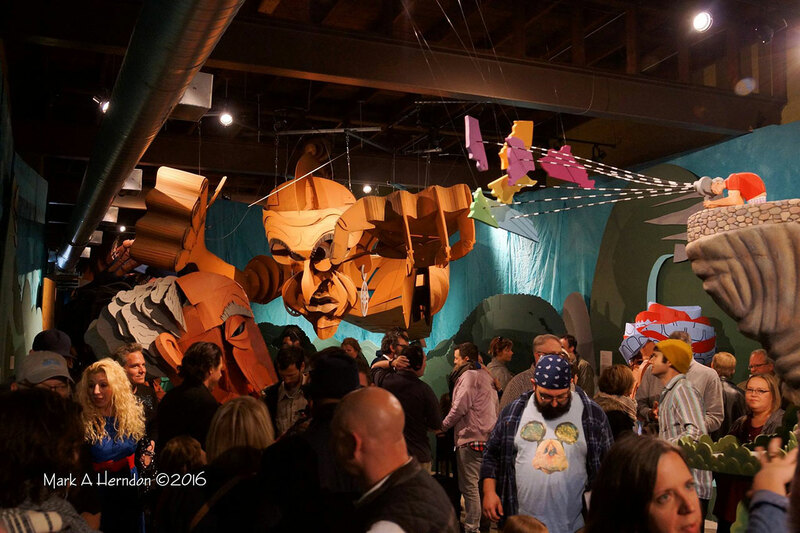 The Emmy-winning artist and Chattanooga native Wayne White will astound and inspire with Wayne-O-Rama, a unique yearlong indoor Southside funhouse of Chattanooga history, presented by The Shaking Ray Levi Society at the Tenn Arts space. 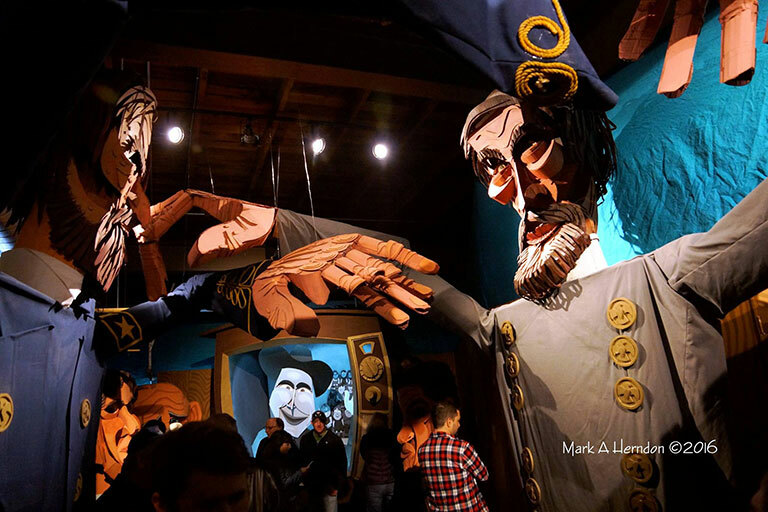 Wayne-O-Rama playfully and vividly recreates scenes and pays tribute to notable figures from centuries of Chattanooga’s rich history with incredible interactive sculptures, giant puppets, immersive sound design and much more. 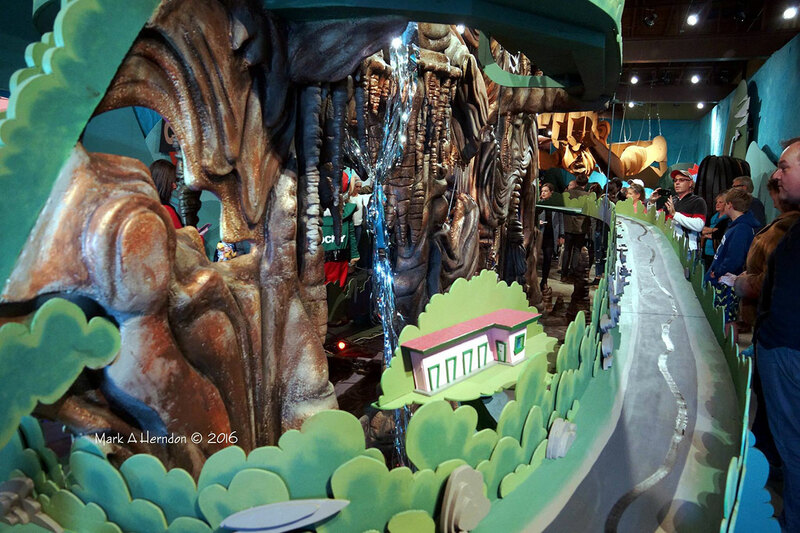 Imagine Pee-wee’s Playhouse crossed with the Smithsonian – that’s the vision for Wayne-O-Rama, which serves as a hub of cultural and educational activity for art, music and history by hosting events, performances, workshops and more. 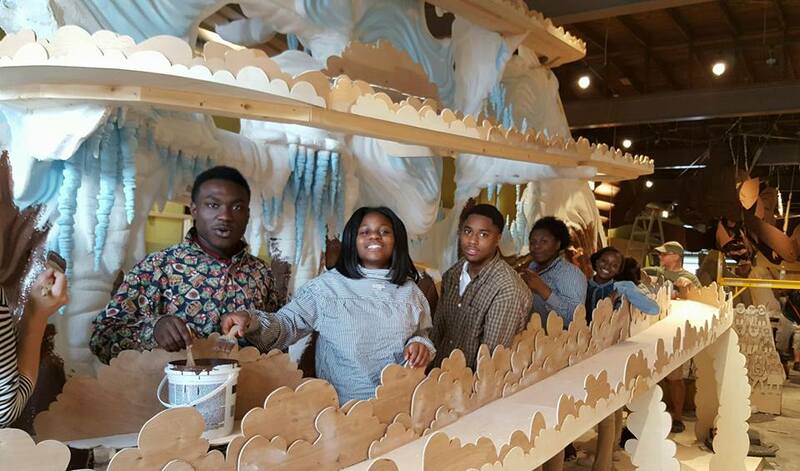 This project encompasses much more than an installation and involves a wide variety of art, storytelling and animation workshops led by Wayne White and local artists. 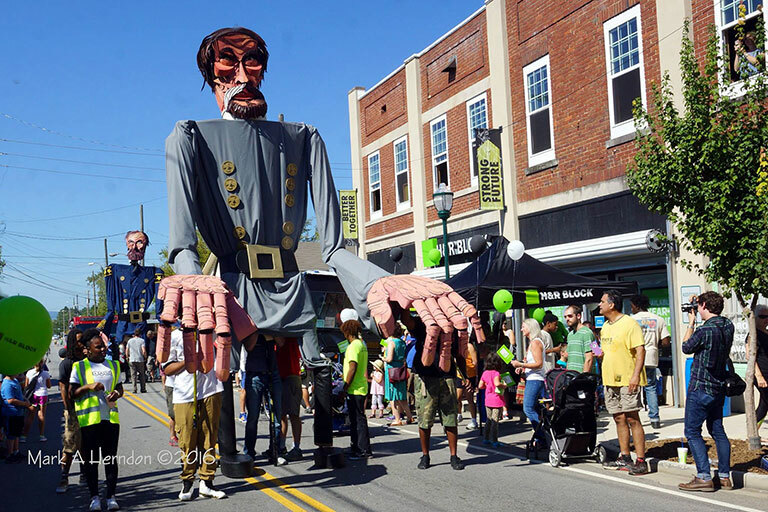 Collaborative events at Wayne-O-Rama include giant puppet parades, music and dance performances, and art showcases, involving numerous local and regional organizations. Wayne has saved his most personal, meaningful ideas for Wayne-O-Rama with several goals in mind. 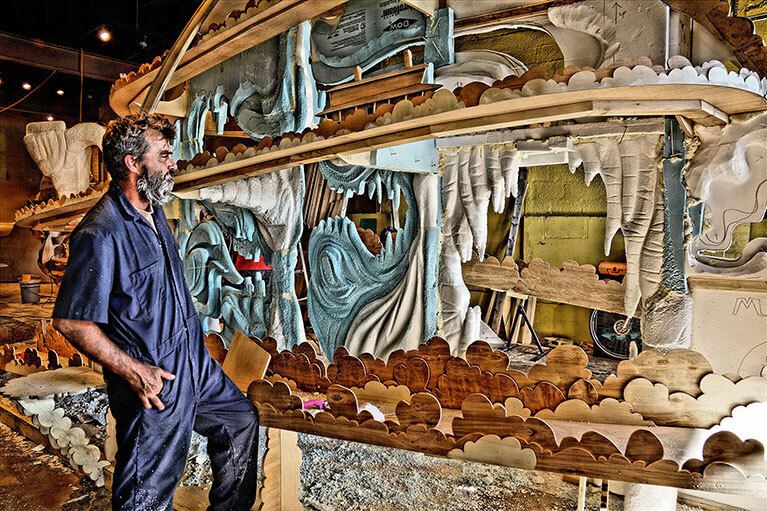 He wants to bring a sense of play to art, to pay tribute to his Southern roots and to inspire and stimulate the imagination of a new breed of Tennessee artists – from the youngest to the oldest – and encourage and foster creativity in everyone. Wayne White was born and raised in Chattanooga, Tennessee. Originally White built his reputation as a world-class illustrator, animator, puppeteer, cartoonist and art director in New York and Los Angeles. He is most well-known as the Emmy-award-winning set and puppet designer of the seminal and influential 1980s children’s TV show “Pee-wee’s Playhouse.” In the last 16 years, White’s reputation in the art world has been firmly established with his masterfully created word paintings and for his rollicking, site-specific installations. The critically-acclaimed 2012 documentary “Beauty is Embarrassing” is a chronicle of his life and times. 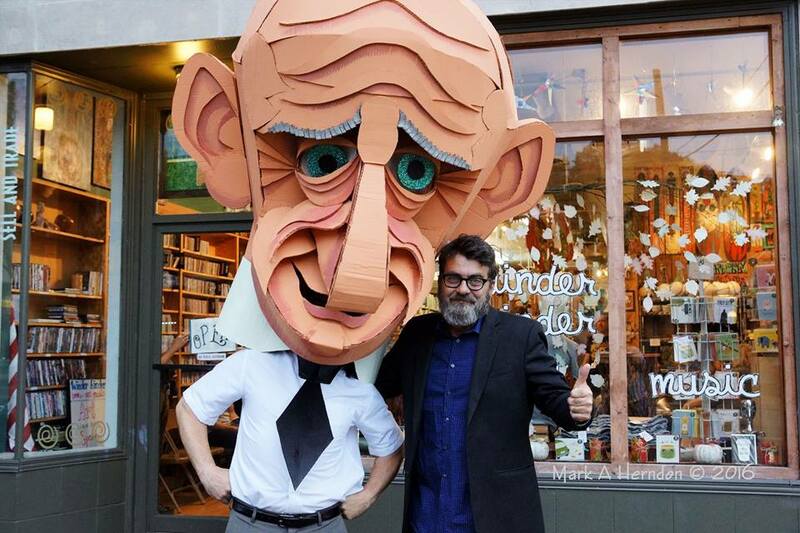 Want to see more photos of Wayne-O-Rama? Check out our PHOTO GALLERIES! Wayne-O-Rama is sponsored by See Rock City, Inc. and presented by The Shaking Ray Levi Society at the Tenn Arts space, with generous support from the Benwood Foundation, the Footprint Foundation, the Lyndhurst Foundation and the McKenzie Foundation. 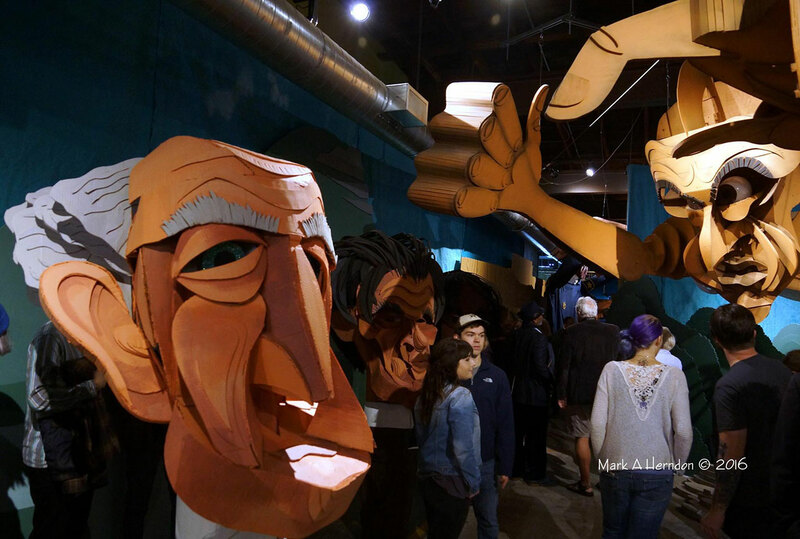 Wayne-O-Rama is administered by the Shaking Ray Levi Society, a 501(c)(3) non-profit arts education organization founded in 1986 to nurture and support non-traditional arts to help nourish the cultural growth of Chattanooga. The Shaking Ray Levi Society is a funded agency of ArtsBuild of Chattanooga. Is your organization interested in opportunities to partner with Wayne-O-Rama? Contact us! The Shaking Ray Levi Society and Tenn Arts announce the grand opening of Wayne-O-Rama on Saturday, November 19th 2016 from 2:00 – 7:00 PM. 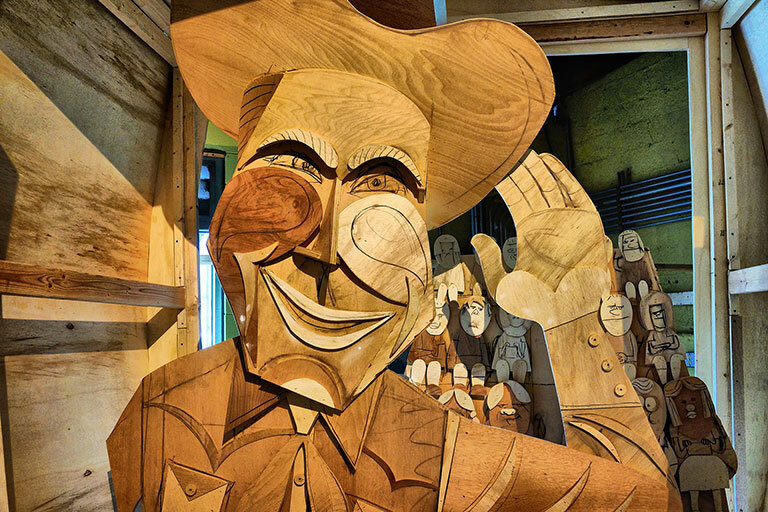 This yearlong installation by 4-time Emmy Award-winning artist Wayne White will astound and amaze as guests experience a Chattanooga history funhouse. Sponsored by See Rock City, Inc. with support from the Benwood Foundation, the Footprint Foundation, Lyndhurst Foundation and the McKenzie Foundation, these larger-than-life puppets and installations depict Lookout Mountain, Chief Dragging Canoe, Bessie Smith, Chattanooga broadcasting legend Bob Brandy and a host of notable Chattanooga figures. Dec. 3, 2016. Visit Wayne-O-Rama and the working studio in the Love Gallery for a fun open house event. Tour the studio and talk with team members about the yearlong installation. WAYNE-O-RAMA CONCERT SERIES PREMIERE EVENT! This unique show features the dynamic sax/bass/drums jazz outfit Jeff Crompton Trio (Atlanta/Chattanooga) and the toy piano virtuoso Robert Fleitz (NYC). No mere novelty, the toy piano is an instrument that has been used in compositions by noted 20th century composers John Cage and George Crumb, and Fleitz will demonstrate its versatility, playing selections by Pulitzer Prize-winner Julia Wolfe, Puerto Rican-born composer Angélica Negrón, Molly Joyce, Monica Pearce, Olivia Kieffer and Andrew Krahn, and he will perform the world premiere of Jeff Crompton's "Sonatina for Toy Piano." The Wayne-O-Rama Concert Series continues its momentum of bringing absolutely unique and unusual music performances with its second concert, featuring a pair of adventurous percussionists, Tim Feeney and Erik Gehrke, with singular, visionary drum explorations that go beyond tradition in astounding ways. The surrealist American musician Bruce Hampton began his career with an unprecedented six figure record deal in 1970. The Hampton Grease Band's first album, Music to Eat, is said to have been the second worst selling album in the history of Columbia Records (A yoga record was the worst selling album.) He made a brave decision and continued his musical career, devoting himself to creating pure art rather than attempt any commercial success. The result has been an amazing, influential 50 year catalog of music and philosophy, including acclaimed bodies of work with The Late Bronze Age, Aquarium Rescue Unit, Fiji Mariners, The Codetalkers and The Quark Alliance. On Space Ghost Coast to Coast, Hampton was the voice of a potted shrubbery named Warren, and in the film Sling Blade, he played the role of the band manager Morris. In 2012, the documentary Basically Frightened: The Musical Madness of Col. Bruce Hampton, Ret. was released. Dubbed the father of the Jam Band music scene, he is a guru to many a celeb, with many ardent fans, including Billy Bob Thornton, Peter Buck, Derek Trucks and Phish. With 25 years of percussion experience, Joshua C. Green has become one of Chattanooga's most celebrated and versatile drummers and can be heard with artists including Infradig, The Distribution, Josh Garrels and Summer Dregs. His latest project Permanent Record is his personal sonic evolution: utilizing many, many different drumsets, percussion items, and found objects, a new drum loop and accompanying fills will be released every day for one year. Each will be free for download for three days, then archived for sale at the Permanent Record website. Sponsored by Maclellan Apartments, join the Chattanooga Film Festival and River City Company for a special free screening of Beauty is Embarrassing: The Story of One of the Visual Masterminds Behind "Pee-Wee's Playhouse." 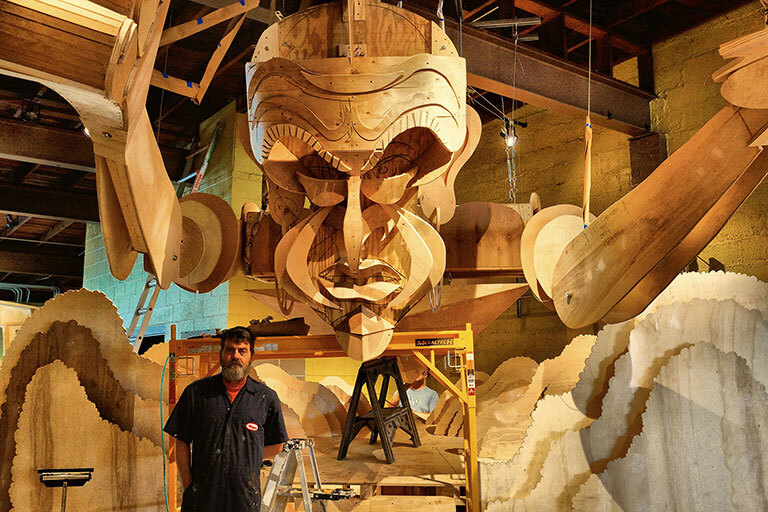 This documentary explores the story of artist Wayne White's creative journey which has included work published in The New York Times, The Village Voice and set and puppet design for Pee-Wee’s Playhouse in which he has won three Emmy awards. Wayne will be on hand to introduce the movie and have a special Q&A at the conclusion of the film. Tired of churning out lightweight comedies, Hollywood director John L. Sullivan (Joel McCrea) decides to make O Brother, Where Art Thou?, a serious, socially responsible film about human suffering. After his producers point out that he knows nothing of hardship, Sullivan, disguised as a hobo, hits the road. En route to enlightenment, he encounters a lovely but no-nonsense young woman (Veronica Lake)—and more trouble than he ever dreamed of. This comic masterpiece by director Preston Sturges is among the finest Hollywood satires, and a high-water mark in the career of one of the industry’s most revered funnymen. A hybrid performance – part documentary, part conjuring, part performance art – MIND ON HEAVEN explores the boundaries of memory and embodiment. Using live audio and video mixes, original animation, archival texts, storytelling, and dance, two performers tune in to the vibrations of the late Dennis Palmer, a self-taught, avant-garde musician (The Shaking Ray Levis), painter of the American South, and a co-founder of the non-profit organization The Shaking Ray Levi Society. Sound designer Ben Williams and filmmaker Brian Cagle perform their own special ritual with MIND ON HEAVEN: a serious meditation on death, a humorous exploration of an artist’s identity, a nostalgic and bittersweet exploration of stereotypes and cultural tropes of the American South from 1950-1990, and an attempt to channel a very personal feeling associated with a close friend – a spirit of creation, generosity, and originality. The Athens, GA quartet NEW MADRID is rightfully considered one of the brightest groups emerging from Athens' storied scene, with compelling music that mixes elements of post-punk, psychedelic rock, pop and grunge, all with a Southern sensibility. Drawing heavy influence from alt-country and noise-rock alike, these four young performers create captivating soundscapes that are simultaneously dense and expansive. With reverb-drenched vocal harmonies that soar over a lush and textured musical patchwork, New Madrid evolved seamlessly from bedroom project to polished product, exploring the depths of psychedelia and noise. CHERRIES JUBILEE is a one-of-a-kind event at the otherworldly venue Wayne-O-Rama, Chattanooga’s history funhouse, featuring three acclaimed, world-class headlining acts: The Cherry Blossoms, Josephine Foster and Wu Fei. This mini music festival will also celebrate the release of the new Cherry Blossoms album The Hank Tapes featuring early songs from 1996 recorded when the late Marc Trovillion (a Chattanoogan and an original member of Lambchop) was the band’s bassist. "Who's Your Daddy?" is an intriguing showcase of music, movement, mischief and madness which promises unexpected sounds and sensations delivered by three seasoned improvisers: Cilla Vee (movement) from Asheville, N.C., Davey Williams (electric guitar) from Birmingham, AL and Evan Lipson (double bass) from Chattanooga, with special guest percussionist Bob Stagner (Shaking Ray Levis).  It wouldn't be the Bessie Smith Strut without Bessie! 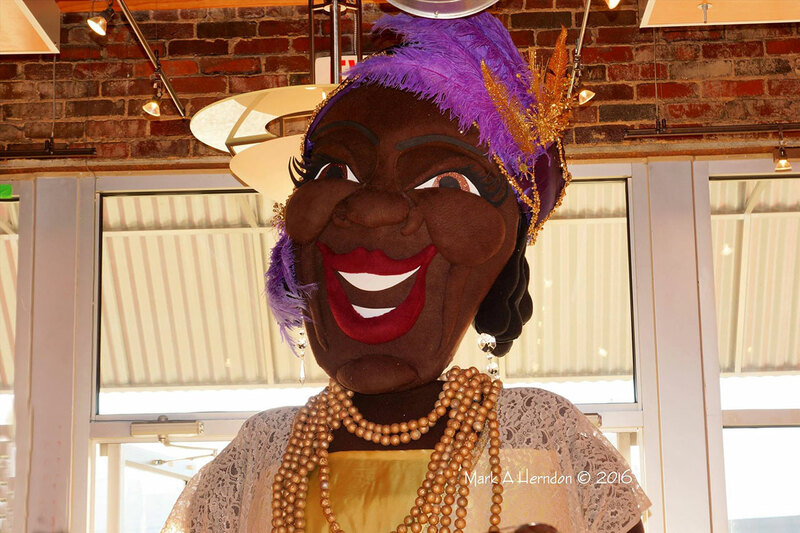 Wayne-O-Rama's own giant Bessie Smith puppet will be there to smile upon the festivities!  Come out, enjoy the music, have a giant smoked turkey leg and dance up a storm at one of Chattanooga's most beloved street festivals! We at Wayne-O-Rama are celebrating Wayne's exhibition at the Hunter Museum (opening Jun 30) with a series of events called "WEEK OF WAYNE"! This is WEEK OF WAYNE Show 1! American guitarist Shane Parish released his second instrumental solo acoustic album, Undertaker Please Drive Slow, late in 2016 on Tzadik Records. The music for this album was conceived in a single night of inspiration in February 2016 when Parish freely interpreted several Appalachian, folk, blues, gospel, and old English tunes into his tape recorder, allowing all of his background in classical guitar, country blues, jazz, and free improvisation to blend into a seamless and effortless flow. This demo caught the ears of the legendary NYC saxophonist and composer John Zorn, who immediately offered to produce the album. When guitar maestro Marc Ribot heard these recordings he said, “Shane Parish is one of the most interesting new guitar voices to come out of the country blues tradition of Mississippi John Hurt, Lightin Hopkins…” Having long established his creative voice as a radical electric guitarist in his long-running band Ahleuchatistas, Parish is now revealing a more elaborate and intimate inner world with his solo acoustic performances of whimsy, passion and virtuosity. We at Wayne-O-Rama are celebrating Wayne's exhibition at the Hunter Museum (opening Jun 30) with a series of events called "WEEK OF WAYNE"! This is WEEK OF WAYNE Show 2! The WHAT CHEER? BRIGADE from Providence, RI is a 19-piece mobile party, like a marching band on an atomic fireball sugar rush that darts from New Orleans brass band tunes to Bollywood dance numbers to whirlwind Balkan folk to bombastic hip-hop, with a ton of surprises along the way. It has been four years since the SRLS brought their merry insanity to Chattanooga, and their return will guarantee to deliver an unforgettable dance 'splosion. * Frank Pahl (Michigan), the award-winning multi-instrumentalist, composer, instrument inventor and creator of automated sound sculptures, also known as a member of the avant-folk outfit Only a Mother and Little Bang Theory which only uses toy instruments. * Bill Brovold (Detroit/NYC), the guitarist, composer and visual artist who was a fixture on the downtown NYC scene in the '80s and worked closely with sonic pioneer Rhys Chatham before founding the visionary, Detroit-based rock incubator, Larval. * Duet for Theremin and Lap Steel (Atlanta), the 10-plus-year strong duo that creates hypnotic pulses and dreamy drones that weave together to form a kaleidoscope of sounds and moods, like a long-lost soundtrack to a deep-sea documentary.  * Wayne-O-Rama All Stars, led by Wayne White (on banjo) himself, will put a new shine on classic tunes with an overflowing cauldron of local talent including Bryan Dyer, Eric Fairchild, Randy Fairchild, Joe Lance, Bob Stagner and Barry Wilde. Come explore the exuberant world of artist Wayne White! 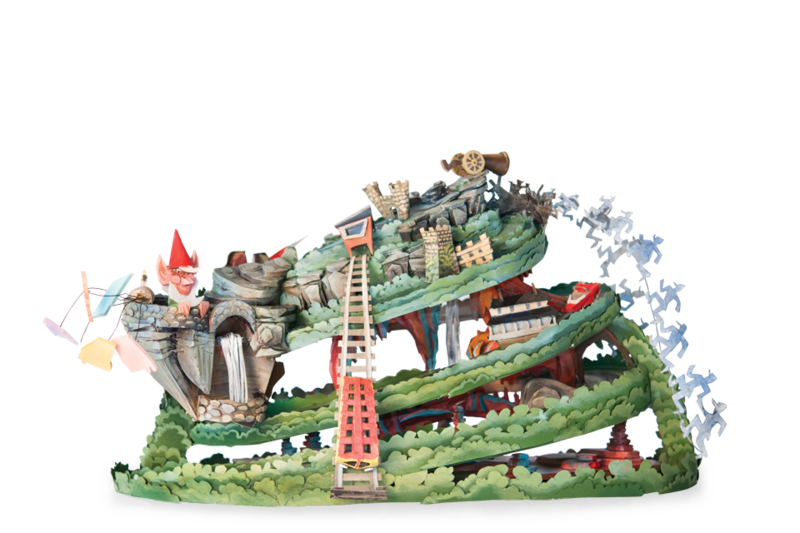 Populated by larger than life puppets, wildly vivid paintings and fantastical sculptures, this summer exhibition promises to be fun, entertaining and engaging for children of all ages. Characterized by a playfully satirical take on the art world, Wayne’s paintings and sculptures also draw on his nostalgia for his Southern roots. Alto and soprano saxophonist Jack Wright is a sax titan with a career that spans five decades in the world of free improvisation. With a command of the sax that is at the top of his field with a passionate, kinetic playing style and a huge sound vocabulary, he has been called “the most indispensable musician of his generation” and “the reference par excellence for all the generations who have followed.” (Jazzosphere). Evan Lipson has operated as a musician since adolescence—intuitively seeking the liminal zones in which intellect and instinct, history and myth, and creative and destructive force intersect. "Borbetomagus: A Pollock of Sound" is the first feature-length documentary about the legendary improv / noise group Borbetomagus. Filmmaker Jef Mertens brings a raw, urgent, and unpolished vision focusing on a band that has spent almost four decades defining and redefining not just their music, but the boundaries of music itself. Band members Don Dietrich, Donald Miller, and Jim Sauter tell their story with the help of artists, writers, photographers, and filmmakers that include noted critic Byron Coley, drummer Chris Corsano, guitarist Thurston Moore, groundbreaking Japanese noise unit Hijokaidan, and Switzerland's masters of "cracked electronics," Voice Crack. Includes never-before-seen archival footage, amazing photographic finds, and previously unreleased recordings. Regular admission ($15 adults, Free to members and children 17 and under with paying adult). Explore Wayne White’s work through the eyes of a cooperative of local artists. The artists will first take us into the exhibit to show a work that inspired them and then invite us into the lobby to participate in creating a kinetic and interactive work of art inspired by Wayne White himself. 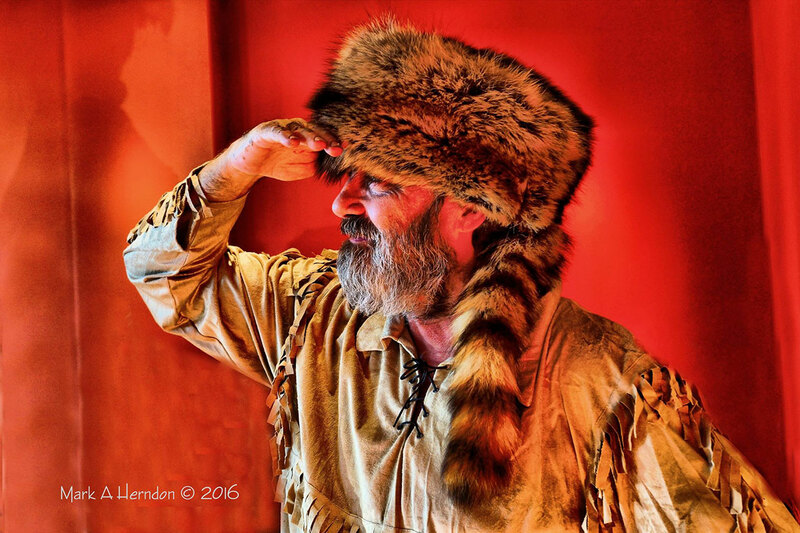 Music from Old Time Traveler - Matt Downer and a cash bar will be available to inspire guests as they create. Exhibition open from Aug 4 to Aug 28. Lead and envisioned by Wayne White, Wayne-O-Rama couldn't have happened without the support and creativity of Chattanooga's art community. 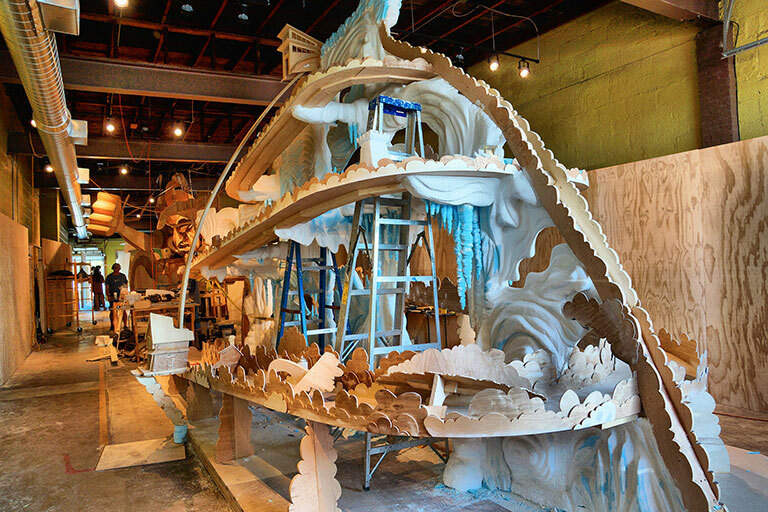 For several weeks, local artists donated time, materials, skills, and sanity to make the funhouse of history a reality. Join us as we celebrate 13 artists' work, sharing insight into their creative process, inspiration, and the impact of working with Wayne White. Curated by Jerry Reed (of the bands Lacing and Rough Rope and the label guru behind Failed Recordings) in its fifth and final year, Leaky Sockets promises an evening of uncompromising, bleeding-edge music from a diverse assortment of artists from across the nation. abandoned ships is geographer, teaching artist, storyteller and puppeteer Milissa Orzolek. She fell into the world of puppetry in 2010 as a puppeteer with a production of "Fantastic Mr. Fox" in New Orleans. 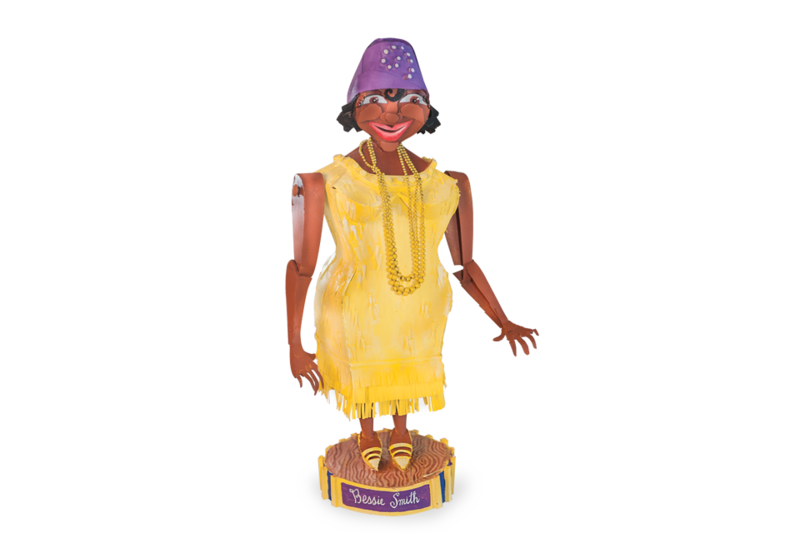 Since that time, she has puppeteered in the New Orleans Fringe Festival, the New Orleans Giant Puppet Festival, Potpourri at the National Puppetry Festival in Hartford and Puppet Slamwich in Baltimore. In 2016, abandoned ships received a Jim Henson Foundation Family Grant for the original production "What Keeps Us." David Greenberger and Prime Lens will present a live experience featuring the Duplex Planet publisher and NPR contributor narrating written pieces to the interpretive sounds of long time collaborator Bob Stagner, double bassist Evan Lipson and keyboardist Tyson Rogers, to celebrate the release of the new CD "My Thoughts Approximately." Dennis Palmer of the Shaking Ray Levis died quietly in his sleep, succumbing to heart problems that had been shadowing him for a couple decades.  Working with co-founder and drummer Bob Stagner, and David Greenberger, they had just completed a new album, "Tramps That Go Think in the Night" on the tenth anniversary of their first collaboration, "Mayor of the Tennessee River." As part of a two-night concert event celebrating Palmer’s life and work in 2013, David and Bob were joined by bassist Evan Lipson and keyboardist Tyson Rogers for a performance. They debuted their new ensemble, David Greenberger and Prime Lens, at the Big Ears Festival in 2014 (festival founder Ashley Capps dedicated the three day event to the memory of Palmer and Lou Reed). Since it was Dennis who had brought them together in the first place, “and Prime Lens” is an anagram of “Dennis Palmer.” "My Thoughts Approximately" draws on four decades of conversations David Greenberger has had with elderly in various cities and circumstances, which are the starting point for the thirty emotionally, rich, character driven monologues. For two decades artist David Greenberger (best known for 32 years of his periodical, The Duplex Planet) has been exploring the ways in which music can be wedded to spoken monologues. His conversations with old people are the basis for the text he develops. He presents characters who still find pleasure in the company of others, and who open up, sometimes in very small ways, to someone taking an interest in them. This is Greenberger’s art: eschewing oral history, abstracting dialogues by shaping them into works that resonate with shared humanity. Over the years he has worked with a range of musical collaborators, among them Terry Adams (NRBQ), David Hidalgo & Louie Perez (Los Lobos), Glenn Jones, Chris Corsano, Robyn Hitchcock, Wreckless Eric, 3 Leg Torso, Paul Cebar, and Birdsongs of the Mesozoic. Mimi Pond book signing for "The Customer Is Always Wrong"
Told in the same brash yet earnest style as her previous memoir "Over Easy," "The Customer is Always Wrong" is the saga of a young naïve artist named Madge working in a restaurant of charming drunks, junkies, thieves, and creeps. Taking place in Oakland in the late seventies, Pond’s story details the trials and tribulations of Madge’s daily grind as a waitress at the Imperial Cafe. Guests will experience Wayne White's exhibit "Thrill After Thrill" through the artist's eyes and enjoy an entertaining and memorable night in the world of Wayne White. Maker Faire is the Greatest Show (and Tell) on Earth—a family-friendly showcase of invention, creativity and resourcefulness, and a celebration of the Maker movement. It’s a place where people show what they are making, and share what they are learning. Makers range from tech enthusiasts, to crafters, to homesteaders, to scientists, to garage tinkerers, and are of all ages and backgrounds. Wayne-O-Rama is excited to be a part of the Maker Faire by presenting a workshop for kids, where they can create their own sculptures to take home! 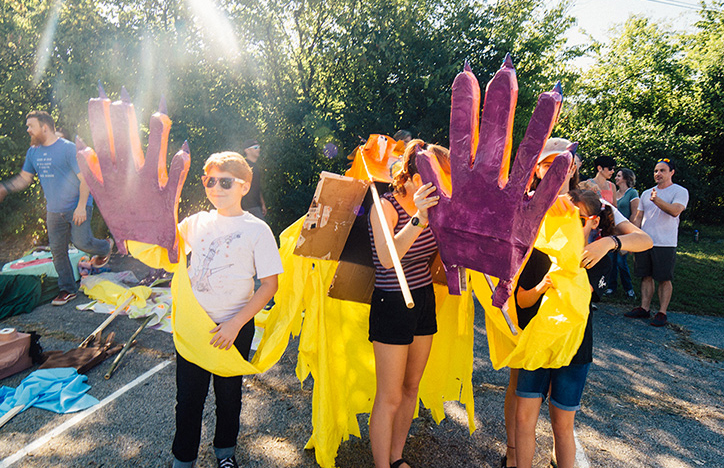 Learn about the artist Wayne White (who has won 3 Emmy awards for his work on "Pee-wee's Playhouse"), see the enormous collaborative Wayne White puppet (coordinated by artist Matthew Dutton) and build your own unique art creation with artists who worked on Wayne-O-Rama! Students aged 7-15 are invited for this workshop experience. Walk-ups welcome! In this one-man performance utilizing hand, rod, and glove puppets, David Stephens retells classic fairy tales as well as telling a few of his own original tales. You'll see what happens when three billy goats try to cross over a bridge belonging to a greedy troll in "The Three Billy Goats Gruff." Parker Pig encounters some good luck when he stumbles over a watering can in a retelling of "The Three Little Pigs." One of Stephens' original stories, "The Two Farmers," involves Farmer Frick and Farmer Frack and how they learn to work together to make a pot of stew. All this, plus the antics of some silly chickens, in "Billy Goats Gruff and Other Stuff." Originally developed in 2001, this show has entertained both children and their parents since that time. 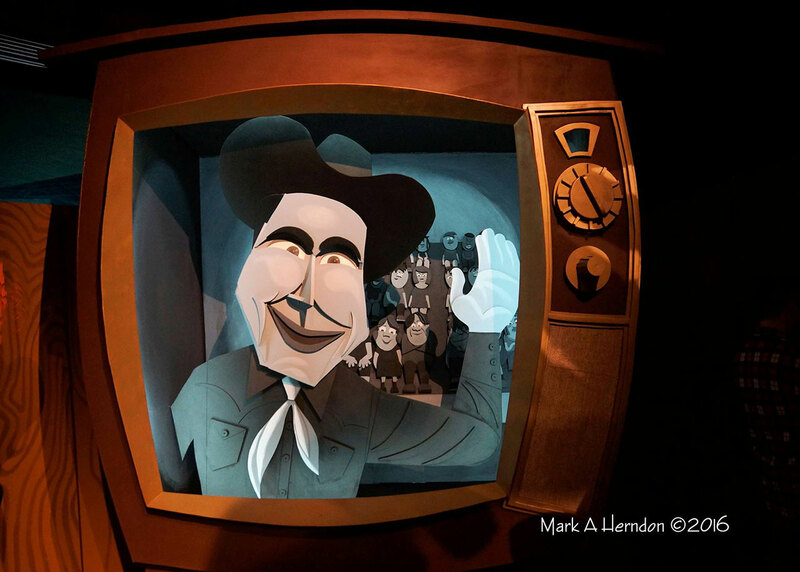 The Center for Puppetry Arts hosted an 8-week run of over 100 virtually sold-out performances of this production in 2002. Since then, the Center has hosted two equally successful revivals in 2004 and 2007. 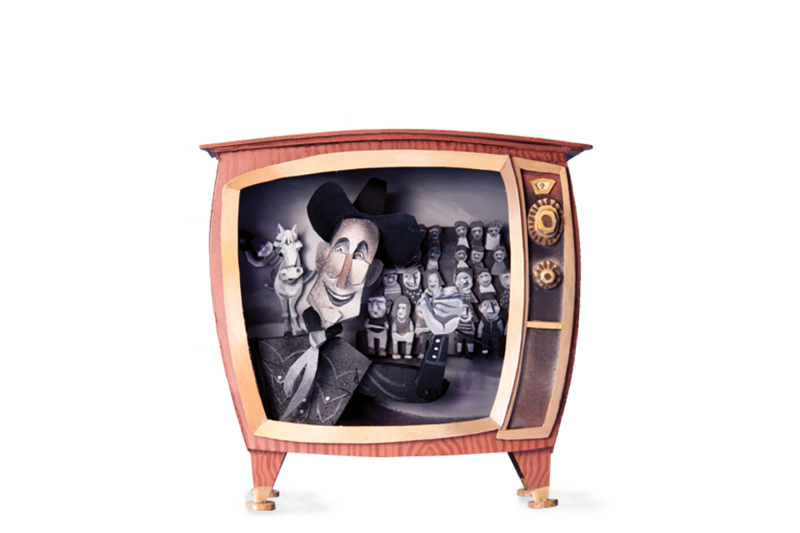 In 2005, this show was honored by receiving a Citation of Excellence from UNIMA-USA (Union Internationale de la Marionette): the equivalent of an Academy Award in the puppetry world. Art Exploration Days are available this year at Wayne-O-Rama! Hamilton County teachers can sign up for this unique field trip experience for their students. Please contact us for scheduling information. During this yearlong installation project many of the events hosted by the Shaking Ray Levi Society will take place at Wayne-O-Rama. Visit the Shaking Ray Levi Society website for more info! You can help right now by making a tax-deductible donation to support Wayne-O-Rama and its outreach and educational programs! 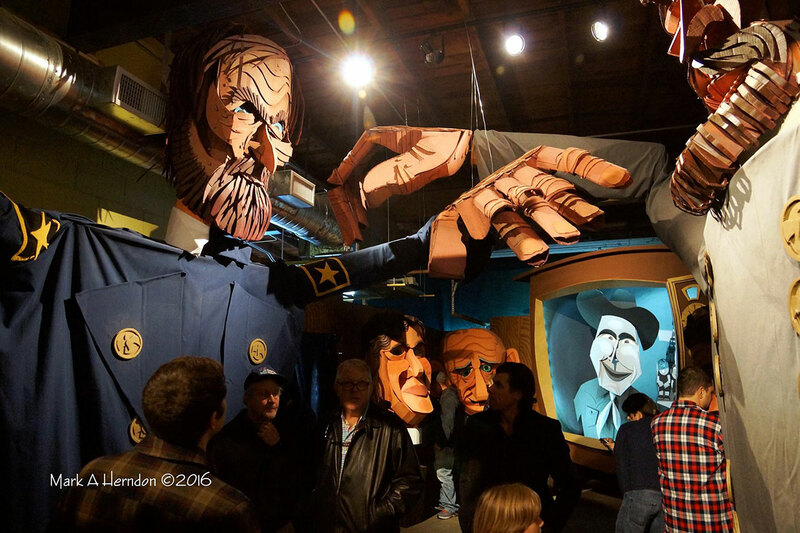 We firmly believe that Wayne-O-Rama is one of the most amazing and inspiring installations that Chattanooga has ever seen. Although we’ve received foundation support, we still need your help to sustain Wayne-O-Rama and its outreach and educational programs for the next year. Be a part of Wayne-O-Rama! Please consider contributing – no donation is too small – to this unique, once-in-a-lifetime project. Click Here to Donate IMPORTANT: click on “Select a designation” under “I want my donation to be designated toward:” and select “Wayne White Project Fund”.